Hotel ShivMurti is a conveniently located property, which offers luxurious services and hospitality to its guests at affordable cost in Haridwar. Keeping in mind the needs of travellers, the hotel offers contemporary facilities and efficient services, along with basic but comfortable accommodation. Hotel Shiv Murti is located in the heart of town, just 200 metres away from the Railway station and bus stand. This budget hotel in Haridwar enjoys proximity to all places of tourist and religious interest. The hotel Shiv Murti offers comfortable accommodation in 65 well furnished rooms that are categorised as Executive Family Suites, Executive rooms, Super Deluxe rooms and Deluxe rooms. 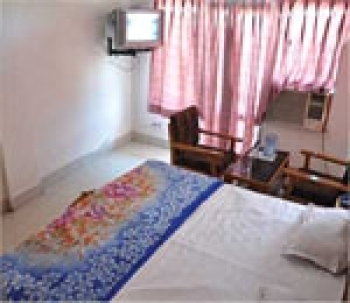 Air conditioned as well as air cooled rooms are available and each room is equipped with all modern amenities including colour television with satellite connection, direct dial telephone and a geyser in the attached washroom. The in-house multi cuisine restaurant, Khana Khazana, serves vegetarian North Indian, South Indian, Chinese and Continental delicacies. Room service is available round the clock in Shiv murti hotel. - All jurisdictions are subject to Haridwar Dist. only.